Body Intelligence or Body War? This week, I’ve come across two very different approaches to young bodies in the media. One is the announcement (and subsequent activism response by the amazing Golda Poretsky) that the television show “The Biggest Loser” will now include teenagers and the other is a new study about the effectiveness of “intuitive eating” among young adults. It’s hard to imagine a stronger dichotomy than these two approaches. On the one hand, we have “The Biggest Loser” which teaches us that our body is the enemy. No punishment is too harsh. No humiliation is too great. We must deprive ourselves of delicious foods. We must exercise until we vomit or pass out. We must make our bodies thin at all costs. The study outlines a different approach (at least to eating) by documenting the outcomes of young adults who practice intuitive eating. The study defines intuitive eating by the young people “trusting their bodies to tell them what to eat” and “stopping eating once they felt full”. Based on the Biggest Loser story, one would imagine that those who trust their bodies and allow hunger to guide their eating would be larger than those who focus on controlling body weight. However, the study seems to indicate the opposite. Those who trusted their bodies not only had fewer signs of disordered eating, but also had a lower average BMI. Now, it’s important to remember that this is only one study. But we’ve yet to unearth a single study that indicates that deprivation and self hatred is an effective way to maintain a lower body weight or BMI over the long term (more than 5 years). So what should we be teaching our kids, to love their bodies or make war on them? While it seems obvious to me that teaching kids to trust the innate intelligence of their bodies is the better choice, I think it’s important to recognize this is not the easier choice. I think peer pressure plays an enormous role both for children and their parents. I think many of us have faced discrimination and outright cruelty from others because of the size of our bodies. We don’t wish that pain on our worst enemies. So it’s not surprising that we don’t want it for our children. And the prevailing wisdom of the women at the beauty shop, Aunt Thelma and even our pediatricians often involves hushed side conversations about what the parent is going to “do” about a child’s weight. 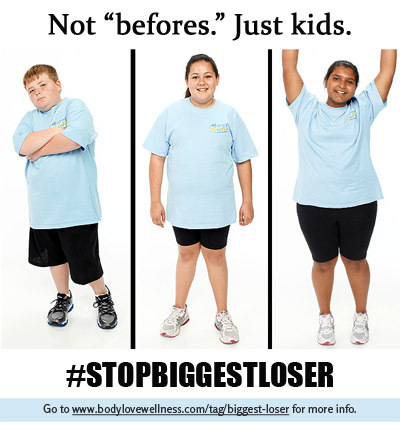 It seems clear to me that peer pressure bends us towards putting our kids on diets, obsessing over their BMIs, forcing them to exercise, sending them to fat camps and yes, even allowing them to be on “The Biggest Loser”, even though there is so, SO much evidence out there showing that this approach doesn’t work. But at some point, we have to ask ourselves, “Is peer pressure a smart way to decide what’s best for kids? Is bowing to peer pressure in this case going to make our kids happier or healthier in the long run?” I think we need to ask the proverbial question, “If our friends tell us to run off a cliff, will we do it?” Or will we put peer pressure aside, assure the ladies at the beauty shop and Aunt Thelma and even our pediatrician that we are doing what science indicates is best for our kids, and teach them that their bodies are wondrous and intelligent and trustworthy? This entry was posted in Uncategorized and tagged BMI, body hatred, body intelligence, body is the enemy, deprivation, dieting, disordered eating, eatting disorder, Golda Poretsky, health, Health At Every Size, Intuitive Eating, peer pressure, teaching kids, The Biggest Loser, trusting our bodies, wellness on December 13, 2012 by fatchicksings. Thought provoking and timely. My 14yo son is talking about losing weight…weighing himself…counting calories. I’m trying to be supportive of a healthy lifestyle and discouraging of any dieting behaviors. I’m getting frustrated that he’s picked up these messages somewhere. I’m on hyper alert status watching for eating disordered behavior. I wish I had better ways to help him! So many people I know grew up without even one voice that was rational on the subject of weight. If you can be that voice for your son, that will be an amazing help to him. Even if he can’t hear that voice right now, it’s sure to mean a lot to him in the coming years. Stay strong Susie!